This post contributed by AWS Senior Cloud Infrastructure Architect Anabell St Vincent and AWS Solutions Architect Alex Kimber. The previous post, Maintaining Transport Layer Security All the Way to Your Container, covered how the layer 4 Network Load Balancer can be used to maintain Transport Layer Security (TLS) all the way from the client to running containers. In this post, we discuss the various options available for ensuring that certificates can be securely and reliably made available to containers. By simplifying the process of distributing or generating certificates and other secrets, it’s easier for you to build inherently secure architectures without compromising scalability. Certificates and keys can be included in the Docker image and made available to the container at runtime. 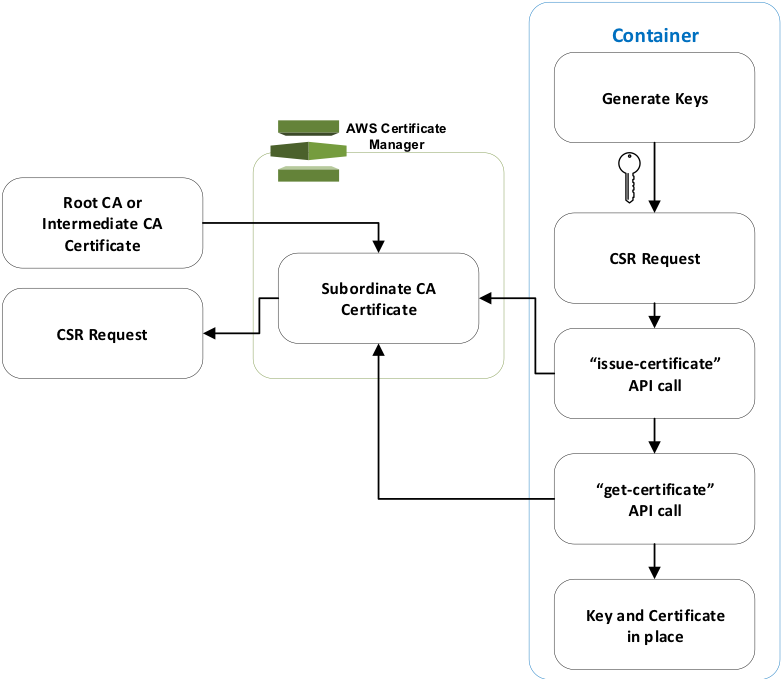 This approach makes the deployment of containers with certificates and keys simple and easy. However, there are some drawbacks. First, the certificates and keys need to be created, stored securely, and then included in the Docker image. There are some manual or additional automation steps required to securely create, retrieve, and include them for every new revision of the Docker image. # Create folders to hold web content and copy in HTML files. From a security perspective, this approach has additional drawbacks. Because certificates and private keys are bundled with the Docker images, anyone with access to a Docker image can also retrieve the certificate and private key. The other drawback is the updated certificates are not replaced automatically and the Docker image must be re-created to include any updated certificates. Running containers must either be restarted with the new image, or have the certificates updated. The post Managing Secrets for Amazon ECS Applications Using Parameter Store and IAM Roles for Tasks explains how you can use Systems Manager Parameter Store to store secrets. Some customers use Parameter Store to keep their secrets for simpler retrieval, as well as fine-grained access control. Parameter Store allows for securing data using AWS Key Management Service (AWS KMS) for the encryption. Each encryption key created in KMS can be accessed and controlled using AWS Identity and Access Management (IAM) roles in addition to key policy functionality within KMS. This approach allows for resource-level permissions to each item that is stored in Parameter Store, based on the KMS key used for the encryption. Some certificates can be stored in Parameter Store using the ‘Secure String’ type and using KMS for encryption. With this approach, you can make an API call to retrieve the certificate when the container is deployed. As mentioned earlier, the access to the certificate can be based on the role used to retrieve the certificate. The advantage of this approach is that the certificate can be replaced. The next time the container is deployed, it picks up the new certificate and there is no need to update the Docker image. Currently, there is a limitation of 4,096 characters that can be stored in Parameter Store. This may not be sufficient for some type of certificates. For example, some x509 certs include the chain and so can exceed the 4,096 character limit. 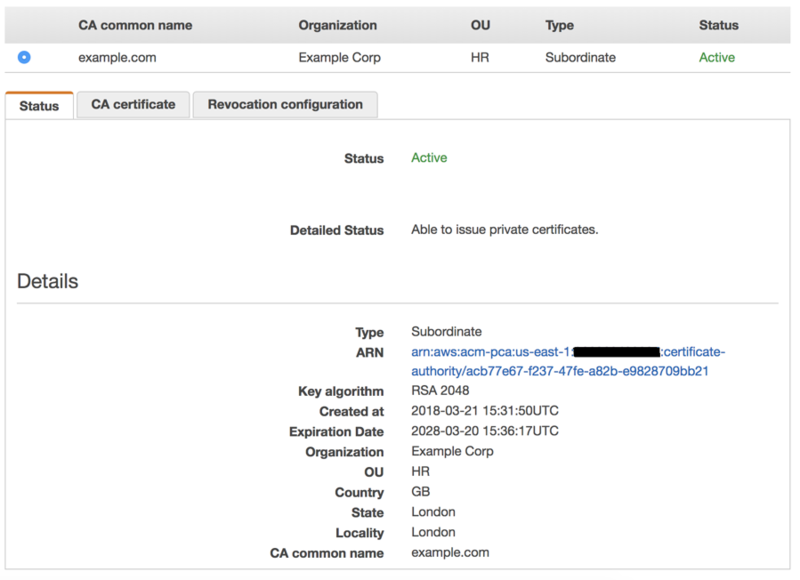 To avoid any character size limitation, Amazon S3 can be used to store the certificate with Parameter Store. The certificate can be stored on Amazon S3, encrypted with KMS and the private key, or the password can be stored in Parameter Store. With this approach, there is no limitation on certificate length and the private key remains secured with KMS. However, it does involve some additional complexity in setting up the process of creating the certificates, storing them in S3, and then storing the password or private keys in Parameter Store. That is in addition to securing, trusting, and auditing the system handling the private keys and certificates. AWS Secrets Manager offers a number of features to allow you to store and manage credentials, keys, and other secret materials. This eliminates the need to store these materials with the application code and instead allows them to be referenced on demand. By centralizing the management of secret materials, this single service can manage fine-grained access control through granular IAM policies as well as the revocation and rotation, all through API calls. All materials stored in the AWS Secrets Manager are encrypted with the customer’s choice of KMS key. The post AWS Secrets Manager: Store, Distribute, and Rotate Credentials Securely shows how AWS Secrets Manager can be used to store RDS database credentials. However, the same process can apply to TLS certificates and keys. Secrets currently have a limit of 4,096 characters. This approach may be unsuitable for some x509 certificates that include the chain and can exceed this limit. This limit applies to the sum of all key-value pairs within a single secret, so certificates and keys may need to be stored in separate secrets. After the secure material is in place, it can be retrieved by the container instance at runtime via the AWS Command Line Interface (AWS CLI) or directly from within the application code. All that’s required is for the container task role to have the requisite permissions in IAM to read the secrets. With the exception of rotating RDS credentials, AWS Secrets Manager requires the user to provide Lambda function code, which is called on a configurable schedule to manage the rotation. This rotation would need to consider the generation of new keys and certificates and redeploying the containers. The advantage of this approach is that it allows the use of TLS communications without any of the complexity of distributing certificates or private keys. However, this approach does require implicit trust of the server. Some applications may generate warnings that there is no acceptable root of trust. It is possible for an organization to build and maintain their own certificate issuing platform. This approach requires the implementation of a platform that is highly available and secure. These types of systems add to the overall overhead of maintaining infrastructures from a security, availability, scalability, and maintenance perspective. Some customers have also implemented Lambda functions to achieve the same functionality when it comes to issuing private certificates. While it’s possible to build a private CA for internal services, there are some challenges to be aware of. Any solution should provide a number of features that are key to ensuring appropriate management of the certificates throughout their lifecycle. For instance, the solution must support the creation, tracking, distribution, renewal, and revocation of certificates. All of these operations must be provided with the requisite security and authentication controls to ensure that certificates are distributed appropriately. Scalability is another consideration. As applications become increasingly stateless and elastic, it’s conceivable that certificates may be required for every new container instance or wildcard certificates created to support an environment. Whatever CA solution is implemented must be ready to accommodate such a load while also providing high availability. ACM Private CA offers a secure, managed infrastructure to support the issuance and revocation of private digital certificates. It supports RSA and ECDSA key types for CA keys used for the creation of new certificates, as well as certificate revocation lists (CRLs) to inform clients when a certificate should no longer be trusted. Currently, ACM Private CA does not offer root CA support. The private key for any private CA that you create with ACM Private CA is created and stored in a FIPS 140-2 Level 3 Hardware Security Module (HSM) managed by AWS. The ACM Private CA is also integrated with AWS CloudTrail, which allows you to record the audit trail of API calls made using the AWS Management Console, AWS CLI, and AWS SDKs. Setting up ACM Private CA requires a root CA. This can be used to sign a certificate signing request (CSR) for the new subordinate (CA), which is then imported into ACM Private CA. After this is complete, it’s possible for containers within your platform to generate their own key-value pairs at runtime using OpenSSL. They can then use the key-value pairs to make their own CSR and ultimately receive their own certificate. Add OpenSSL to the Docker image (if it is not already included). Generate a key-value pair (a cryptographically related private and public key). Use that private key to make a CSR. Call the ACM Private CA API or CLI issue-certificate operation, which issues a certificate based on the CSR. Call the ACM Private CA API or CLI get-certificate operation, which returns an issued certificate. For additional security, it is possible to store the certificate and keys in a temporary volume mounted in memory through the ‘tmpfs’ parameter. With this option enabled, the secure material is never written to the filesystem of the host machine. Note: This feature is not currently available for containers run on AWS Fargate. The task now has the necessary materials and starts up. Clients should be able to establish the trust hierarchy from the server, through ACM Private CA to the root or intermediate CA. One consideration to be aware of is that ACM Private CA currently has a limit of 50,000 certificates for each CA in each Region. If the requirement is for each, short-lived container instance to have a separate certificate, then this limit could be reached. The approaches outlined in this post describe the available options for ensuring that generation, storage, or distribution of sensitive material is done efficiently and securely. It should also be done in a way that supports the ephemeral, automatic scaling capabilities of container-based architectures. ACM Private CA provides a single interface to manage public and now private certificates, as well as seamlessly integrating with the AWS services.